Previously I talked about rug tips HERE. Today let’s talk about how I chose this rug and what decisions you’ll need to make. Previously I had a rug in here that I loved, but really began to think it was a bit small for the space. I’ve moved it somewhere else, and I’ll show you that later. In that rug tip post, I talked about getting the largest size you can afford. Larger is almost always better. I could only go so big, because the space is tight, but I wanted the chairs to fit on the rug, even when someone is sitting in them. I think that is best. This blue and white rug is a 9×7, but I felt I needed to go up a size. Let’s talk about your choices. So the next question was what fiber should I chose? Well for a dining area if you are going to have spills, I do recommend wool, since it cleans so well. I have a cowhide rug at my farm, and it also cleans up very well also. This rug is cotton, and in general I would recommend cotton more for a bedroom or bathroom, where you don’t have food, but my kids are grown so we don’t have a lot of floor spills. Besides we end up eating in the kitchen now so we aren’t using this room as much. Cotton does need to be cleaned more often than wool, but the big benefit to a cotton rug is that it is much more affordable that wool, so that’s a big plus. I chose COTTON for this room. Obviously this is very different depending on what is in the room. Bold color rugs work great in a room with bold colors. Soft color go with soft colors. Make sure your rug feels like it goes in the room. Obviously a red Oriental rug would not work in this room since I have blues, whites and oatmeal colors in the open concept room. But if you have a room with jewel tones, then a red Oriental might be perfect for you. As we discussed last time, you can chose a color that is not in the room, but the intensity of color in the rug needs to make sense in the room. I love white and blue so that is what I was looking for in a rug. I have several blue rugs and they work perfectly with my calm color palette. This room (like my dining room) did not have a lot of color in it, so using a rug is a great way to add color. This rug is blue and white which adds a calm to the room. If your rugs are exposed to a lot of dirt, I really recommend darker colors. We take our shoes off at the door, so I wasn’t so concerned about that, but if your family wears shoes in the house, you might want another color. We also have a collie, but the rugs stay pretty clean at our house. If it’s muddy outside, I do a paw check before I let her back inside. If you have small kids, again, darker would probably be best for you. I chose BLUE AND WHITE. The answer to this question is clearly dependent on your home and your design aesthetic. 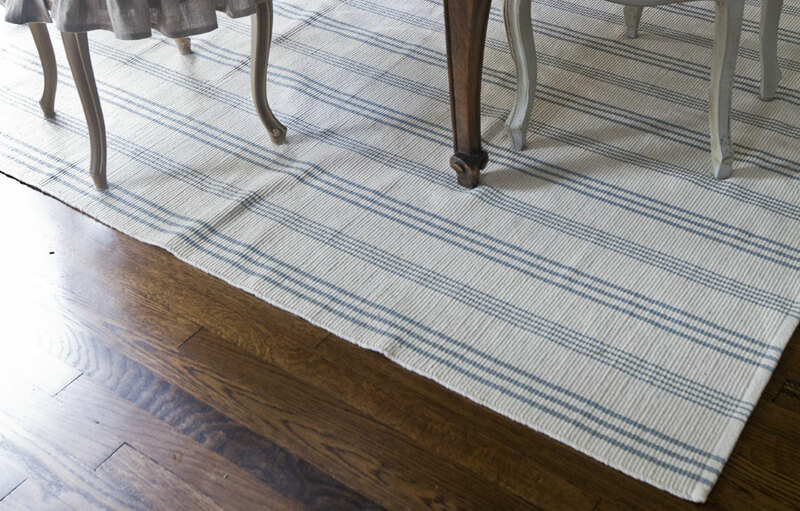 If you love farmhouse French design, then you might want to consider a floral, check, or stripe. I am crazy about stripes, so that was what I was looking for. I prefer a simple pattern, which really works well in my room. I like a simple pattern with just 2 colors. If you have a Bohemian color drenched room, then a a rug with rich color and pattern would work. Remember I have a giveaway going on this month, and there’s just a few days left to enter. 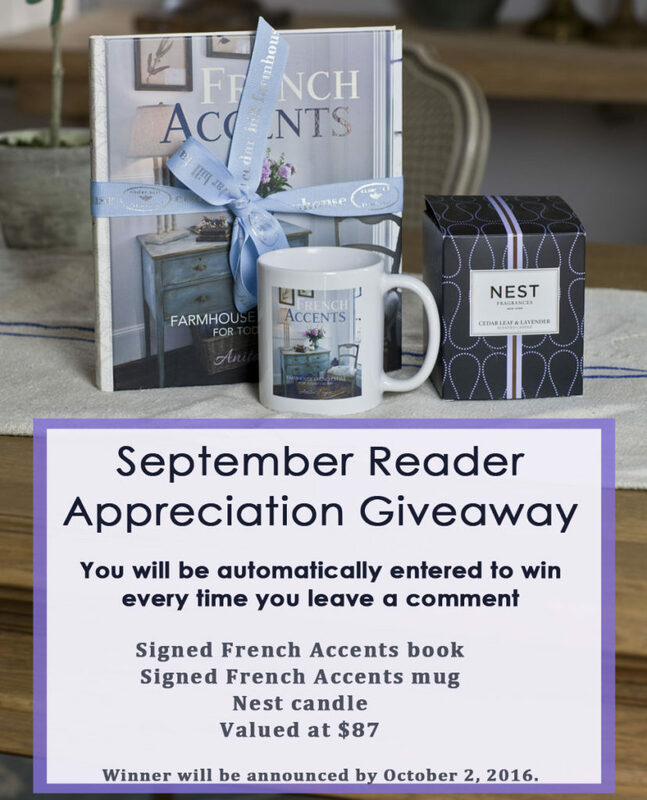 Every time you comment, you are automatically entered to win. Details here. There are braided rugs, shag rugs, flat weave rugs, hand knotted, hand tufted, hand loomed, and machine loomed rugs. I think my favorite kind of rug is a flat weave rug. It just looks very high end to me, even if it is inexpensive. I don’t have room to get into all of the options here, but the flat weave is a good look for many homes. If you notice the rug is not 100% flat. That is because I did not use a rug pad. I do recommend using a rug pad, because the rug won’t shift as much and will not bunch up. I used to use rug pads, but I move rugs around so much and change sizes so often, that it was a big hassle moving the rug pads too. And then when I change size, the rug pad no longer works. But I do like them. This post was graciously sponsored by Annie Selke, maker of Dash and Albert rugs. This SWEDISH RUG can be found HERE. We’ve talked about many rug options about fiber, but at the end of the day, the rug needs to feel good in your room. This rug works because it feels light in here. It’s a Swedish style rug that works so well with French style. 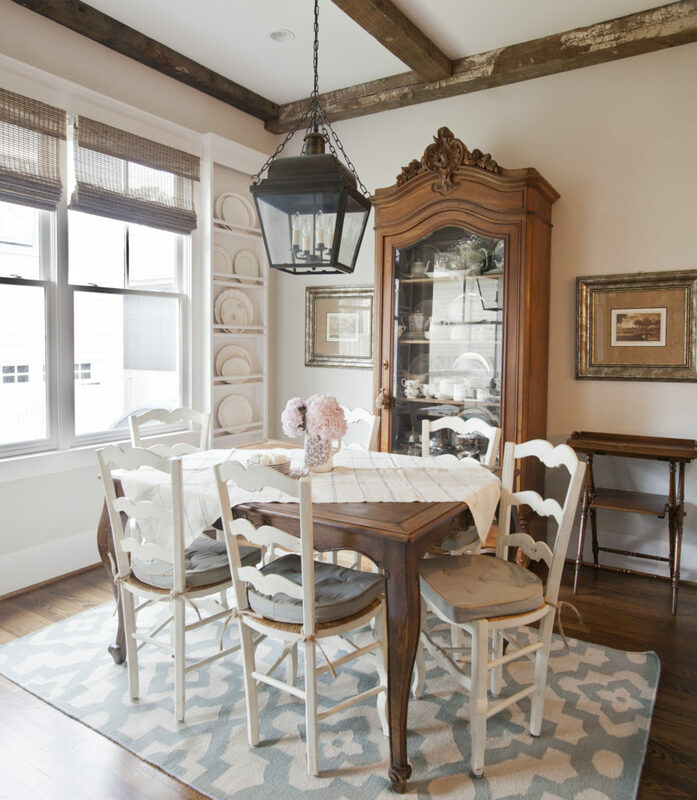 The thing about Farmhouse French style is that it is a mix of the simple and casual with refined French elegance. It brings French style down so that it feels livable and not too fussy. Had I put a fancy ‘foofy’ rug in here the room might have become very stuffy and formal. I want it to feel approachable, friendly, and comfortable. To do that you need to add simple casual elements like this rug. Choosing a rug is very personal, so go with what you love! 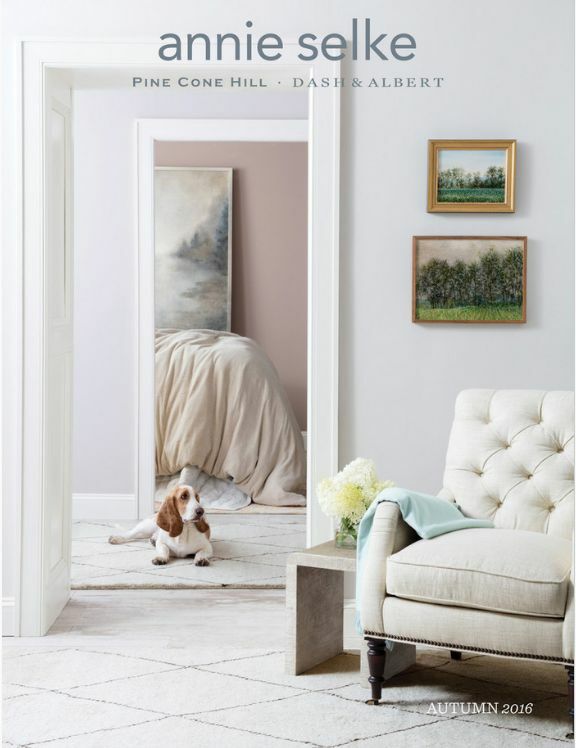 I wanted to be sure you knew that the Annie Selke has a brand new catalog that they will send to you for free. I’ve seen it, and it is full of gorgeous things, including this Swedish rug. To request your own personal copy, CLICK HERE. As always, your room is beautiful. But when I changed color schemes, I had a large oriental left to use. I think for some reason the colors (red,blue and green), they can work for formal or more casual styles. Now I need to figure out a way to make all neutrals in a tv room work with the more formal living room. Thank you for all your suggestions and examples. Yes I think oriental rugs can be dressed up or down. I love this room and the rug fits it perfect. enjoyed this post … I was wondering if there is a “rule” about the margin or bare floor border around the rug , ie, at least 6″ or maybe more , like up to 18″. But perhaps your suggestion of “the biggest rug you can fit/afford” is the answer. A few years ago I bought a beautiful Persian type rug, wool. It is probably now my favorite item in my house, it adds so much class and style. How does one clean an area rug like this? (I mean beyond vacuuming). I’ve seen them done all of those ways. They can be almost as big as the room, or just as big as the seating area. And it has to do with if you like the floor underneath the rug. If it is something you want to cover up, then go as big as you can. If the floor something you want to show off, then smaller works better, so long as the rug isn’t so small it looks skimpy. As for cleaning a Persian rug, I think I would call a professional. Gorgeous eating area. Your tips are very informative. Thank you so much. Love, Love your China Cabinet. Thanks so much for this post. I am looking for a new rug for my dining room. I love your blog!! I have really appreciated your posts on choosing a rug. I have bought so many rugs over the last 10 years because I had no idea what I was doing. I had a sisal in the living room which was great except for the roughness and stains from a sick cat. Then I went with a shag (what was I thinking) in a light color which looked dull very quickly and was difficult to keep clean. Enter the gray wool rug from PB which worked perfectly until my husband insisted on buying a large sectional sofa which was much larger than the rug. Now I have no rug, just bare hardwood floors which was fine for the summer but I am in the market for a large rug this time. Your tips have given me a plan for choosing the right one this time. Thank you! I know! You think you buy one rug and you are done,but things change. love the tips on choosing a rug.. I m recently new to your site and look forward to receiving your emails. I love your ideas and enjoy reading your articles. Many small children and dogs ago, I bought an inexpensive ($150.) rug at LOWES. I believe it was made of something called Olifen.(?). This hard wearing 9×12 light yellow and blue rug is still serving us 20 odd years later…… under our dining room table! ! When it needs cleaning I drag it through the French doors to our patio, use the power nozzle on our hose and it cleans up beautifully. By doing this first thing in the morning it’s dry by evening. I have 5×7 rugs at our front and back doors of the same matrial and they all look as great as the day they were purchased. Two years ago we were on the local Tour of Homes and people were amazed when the docent told about the rugs! I love, love, love and enjoy the wool rugs I have . However for five children and Labrador Retrievers.I could not be more pleased. Well that is excellent information Linda, thank you for sharing!!! I am struggling with rug decisions so this is so helpful and timely. Thanks! Love your room and rug. I went online to take a look and some reviewers said the background was more beige than white/off white. Looks more white in your photo. Would appreciate your comments on this. Sue, great question. I would definitely call it a soft white. It is not beige. It is not super white, but I don’t think you want it any more white or it’s going to look like paper and be really bad about showing dirt. This is a white, but a gentle white. It is whiter than my tablecloth, which has darkened with age. Thanks so much Anita. That’s the answer I was looking for. Have a great day! I am in the market for a new rug, so this is very timely for me. Thanks! This post was just what I needed! Lately I’ve been looking at my breakfast area rug wanting to swap it out with something totally different! Because we have ‘spillers’ in da house, I’ve got to find something durable but fresh and fashionable! To Gayle, your best bet is to take your rug to a reputable oriental rug dealer. They clean the rugs by hand and block them. Anita, I have a flat embroidered French antique Aubusson and even with a rug pad, it still bunches. I’m at a loss. Any other tips? I wonder if a different rug pad would work better. Mine used to slide everywhere, but I didn’t have a rug pad under it. I just layered it on top of a another rug and it seems to keep it in place and not bunching. I like the look of the cotton rug, but how do you make them lay flat. They look like a tripping accident waiting to happen. Gwen use a rug pad. I didn’t in the photo, but they do lie flat with a rug pad. Thank you so much for your tips! 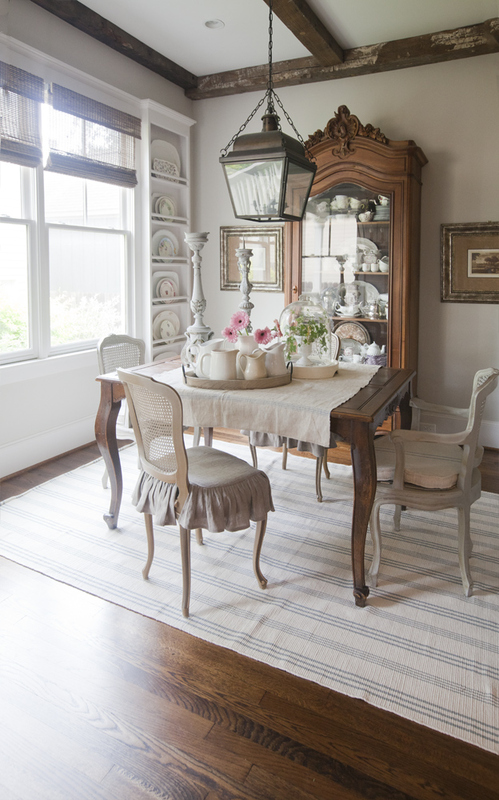 I’ve been considering a natural fiber – sisal – because it looks so neutral. I wold love to know your thoughts on those! ? I Love sisal Debbie. Just keep in mind they are difficult to clean and not comfy to walk on. I love your blog today. Your advise for buying the right rug is much appreciated as I am in the market at the time. A beautiful blog today as usual. I tend to get overwhelmed by choices when rug shopping, so thank you! I’m going to order that catalog today! Great post Anita, everything looks so lovely as always. Hubby and I are planning on removing carpet and adding wood floors to the rest of our downstairs. I mentioned I will need a nice rug for the tv room. xo P.S. You always have an open invitation to share at my Thursday link party. 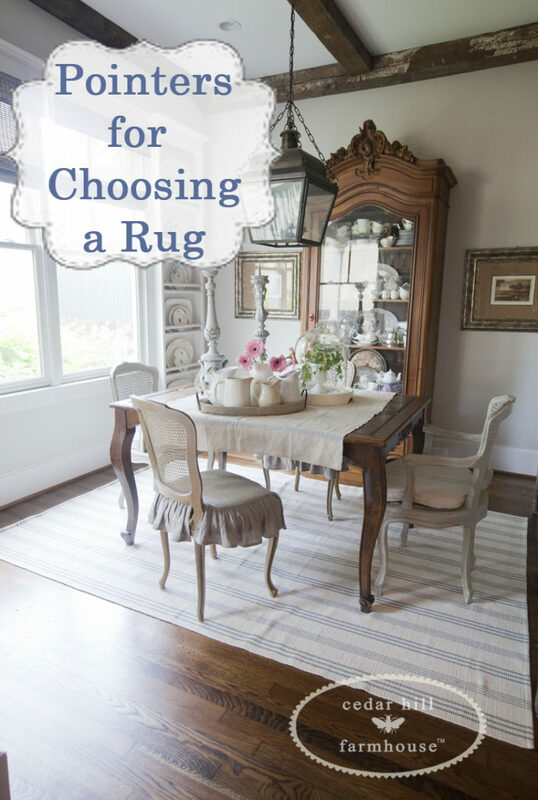 This post is very helpful, im planning on purchasing a new rug for my dining room and was having trouble deciding on the size…i will keep in mind your advice bigger is better….thank you for the great tips…. Your are right! Buy a larger rug so that all your furniture fits on top of. I have learned through trial and error! Thanks for the tips and link to great site to buy rugs. Love your home, so peaceful! Good info on rugs but one thing not mentioned. Don’t you have to be careful about backings or rug pads that can seriously discolor floors? I was told this by the company that refinished my light oak floors and installed the synthetic flooring in my kitchen. I have seen results in previous homes of the chemical reactions on floors that werer ruined forever by using such pads under carpets or smaller rugs with backing. Love the blue and white cotton rug! It’s so perfect for that space. Thank you for the titled picture for pinning! I just rec’d the new Annie Silke catalog. There are some really lovely examples in this catalog. I like your blue and white stripe dining room rug very much, and the way it looks in your room. You can really see the difference how nice the larger size rug looks under the table and chairs…opens up the space. I have several area rugs in my home and each has a rug pad beneath it. Without the pads, on wood floors, walking on them would be a slippery affair and possibly unsafe. I suppose since your rug in pretty much stuck under the table this may not be an issue. Does it bunch up when slipping the chairs in and out from under the table? Good info! Crazy about your gorgeous china cabinet–also admire your built in plate holders. Very nice. Wow, this came at the perfect time, as I am looking for a rug for our living room. We replaced the carpeting with beautiful hardwood in the spring and have been looking ever since. We have a dog and we live in our living room so we need something durable but pretty as well. Again, you gave me some things to consider. As always, thank you! Thanks for the great tips I will be using some of them. The room looks beautiful. Yes, the stripped, larger rug looks nicer/better than the geometric pattern, smaller rug in the area. Thanks for sharing all the inspired ideas. Thanks Anita for the informative post. Love the china cabinet and the table, Its a beautiful room. I always enjoy your blogs and your homes are beautiful. Thanks for this post, your room is beautiful, I really like the look of the flat rug with no pad under it, I will definitely be doing this with my next rug. I love the rug you chose – perfect for your home and the space. I do have a mid-tone blue braided rug under my dining room table, simply because it is darker. I’ve had it forever (it seems) and would love to replace it, but it’s practicality stops me every time. Maybe someday. Thanks for the tips. I cant wait to request a copy.. I have been keeping an eye out for just the right rug to go into our sitting room. I definitely like the new rug more. When you looked at the room in its entirety with the old rug I found that my eye kept going to the rug. I feel the design over powered the rest of the room. The new rug keeps the softness to the room. When I look at the room now my eye doesn’t get stuck on the rug because it blends with the softness of the room therefore letting me appreciate the beauty of everything. Love the new cotton rug. And the table scape is really cute too! What a perfect choice for that room!! It looks so much softer and fits that area! Thanks for your tips. I struggle with what size rug to buy too. We have a wool rug underneath our table now and it’s cream with blue pattern and I am amazed at how well it cleans up! I raised two grand babies here on that rug for 5 years and it still looks good! Thank you so much for all the tips of buying rugs. I have a question. We have a 16 X 12 once living room, turned into a library/piano room with built-in bookshelves. The wall painted a dark gray. Have hardwood floor, but want a throw rug in there, but not sure what to choose for that type of room. No I have not, thank you I will give it a go. I will get my hubby to take a picture of the space as well. See you there. Anita, a rug for the family room has been on my wish list for several years now (keeps getting pushed down the list!). When it gets to number one, I’ll use these tips to make my selection. I’m pretty sure it will be wool. You have some good tips here. I love wool rugs, but I can see the benefits of cotton too. We are house hunting, so I know we’ll be needing some new rugs soon. Thanks for sharing at #HomeMattersParty. Thanks for the pointers. The wood beams on the ceiling are absolutely gorgeous. The whole room is beautiful. Thank you for all the great ideas! Being a lover of light colors I so glad to know how to care for any rugs I may purchase in the future. Any tips for selecting a rug pad for larger rugs…say 8×10’s + that will sit on a low pile carpet? Thanks for the tips. I want to add a rug to our dining area but can’t decide on a style. I’m torn between a flag weave like yours and a woven jute rug, but am concerned the chairs won’t treat the rug well. I’m afraid they’ll catch on a loop and pull the rug out of shape. Oh well, life could be worse than the dilemma I’m in regarding a rug ! LOL. Love your site. I’ve been very inspired by your home. Thanks again. Thank you Debbie. Under a table, I would not use a woven jute rug, because it will stain. I hope that helps. I prefer wool, and some of the indoor/outdoor rugs would also hold up well to staining.